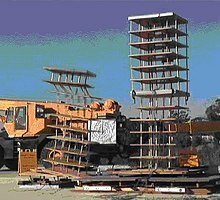 Seismic loading means application of an earthquake-generated excitation on a structure (or geo-structure). It happens at contact surfaces of a structure either with the ground, with adjacent structures, or with gravity waves from tsunami. The loading that is expected at a given location on the Earth's surface is estimated by engineering seismology. It is related to the seismic hazard of the location. The first evidence of earthquake protection by using the principle of base isolation was discovered in Pasargadae, a city in ancient Persia, now Iran, and dates back to the 6th century BCE. Below, there are some samples of seismic vibration control technologies of today. Peru is a highly seismic land and for centuries the mortar-free construction proved to be apparently more earthquake-resistant than using mortar. The stones of the dry-stone walls built by the Incas could move slightly and resettle without the walls collapsing, a passive structural control technique employing both the principle of energy dissipation (coulomb damping) and that of suppressing resonant amplifications. 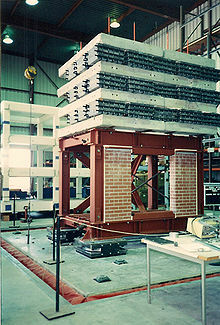 Typically the tuned mass dampers are huge concrete blocks mounted in skyscrapers or other structures and move in opposition to the resonance frequency oscillations of the structures by means of some sort of spring mechanism. 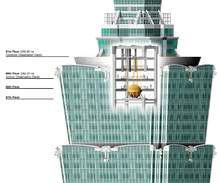 The Taipei 101 skyscraper needs to withstand typhoon winds and earthquake tremors common in this area of Asia/Pacific. 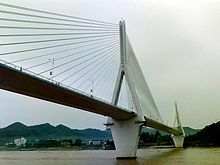 For this purpose, a steel pendulum weighing 660 metric tonnes that serves as a tuned mass damper was designed and installed atop the structure. Suspended from the 92nd to the 88th floor, the pendulum sways to decrease resonant amplifications of lateral displacements in the building caused by earthquakes and strong gusts. Viscous Dampers have the benefit of being a supplemental damping system. They have an oval hysteretic loop and the damping is velocity dependent. While some minor maintenance is potentially required, viscous dampers generally do not need to be replaced after an earthquake. 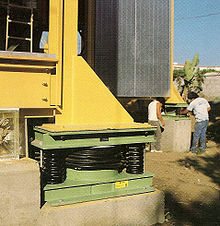 While more expensive than other damping technologies they can be used for both seismic and wind loads and are the most commonly used hysteretic damper. Friction dampers tend to be available in two major types, linear and rotational and dissipate energy by heat. The damper operates on the principle of a coulomb damper. Depending on the design, friction dampers can experience stick-slip phenomenon and Cold welding. The main disadvantage being that friction surfaces can wear over time and for this reason they are not recommended for dissipating wind loads. When used in seismic applications wear is not a problem and there is no required maintenance. They have a rectangular hysteretic loop and as long as the building is sufficiently elastic they tend to settle back to their original positions after an earthquake. Metallic yielding dampers, as the name implies, yield in order to absorb the earthquake's energy. 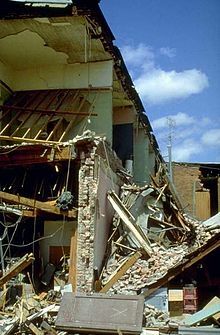 This type of damper absorbs a large amount of energy however they must be replaced after an earthquake and may prevent the building from settling back to its original position. Viscoelastic dampers are useful in that they can be used for both wind and seismic applications, they are usually limited to small displacements. There is some concern as to the reliability of the technology as some brands have been banned from use in buildings in the United States. Base isolation seeks to prevent the kinetic energy of the earthquake from being transferred into elastic energy in the building. These technologies do so by isolating the structure from the ground, thus enabling them to move somewhat independently. The degree to which the energy is transferred into the structure and how the energy is dissipated will vary depending on the technology used. 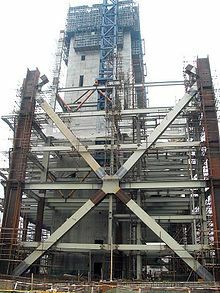 Heavy damping mechanism incorporated in vibration control technologies and, particularly, in base isolation devices, is often considered a valuable source of suppressing vibrations thus enhancing a building's seismic performance. However, for the rather pliant systems such as base isolated structures, with a relatively low bearing stiffness but with a high damping, the so-called "damping force" may turn out the main pushing force at a strong earthquake. 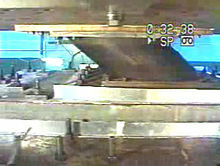 The video shows a Lead Rubber Bearing being tested at the UCSD Caltrans-SRMD facility. The bearing is made of rubber with a lead core. It was a uniaxial test in which the bearing was also under a full structure load. 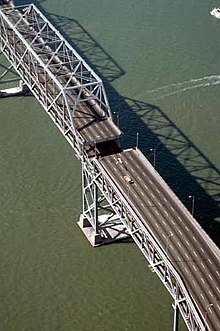 Many buildings and bridges, both in New Zealand and elsewhere, are protected with lead dampers and lead and rubber bearings. Te Papa Tongarewa, the national museum of New Zealand, and the New Zealand Parliament Buildings have been fitted with the bearings. Both are in Wellington which sits on an active fault. Failure mode is the manner by which an earthquake induced failure is observed. It, generally, describes the way the failure occurs. Though costly and time consuming, learning from each real earthquake failure remains a routine recipe for advancement in seismic design methods. Below, some typical modes of earthquake-generated failures are presented. Soft story effect. Absence of adequate stiffness on the ground level caused damage to this structure. A close examination of the image reveals that the rough board siding, once covered by a brick veneer, has been completely dismantled from the studwall. Only the rigidity of the floor above combined with the support on the two hidden sides by continuous walls, not penetrated with large doors as on the street sides, is preventing full collapse of the structure. 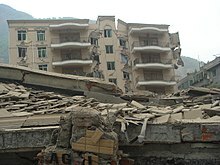 Severely damaged building of Agriculture Development Bank of China after 2008 Sichuan earthquake: most of the beams and pier columns are sheared. 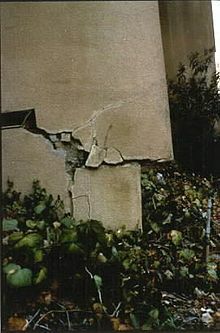 Large diagonal cracks in masonry and veneer are due to in-plane loads while abrupt settlement of the right end of the building should be attributed to a landfill which may be hazardous even without any earthquake. 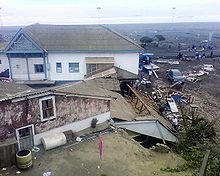 Twofold tsunami impact: sea waves hydraulic pressure and inundation. 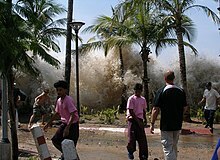 Thus, the Indian Ocean earthquake of December 26, 2004, with the epicenter off the west coast of Sumatra, Indonesia, triggered a series of devastating tsunamis, killing more than 230,000 people in eleven countries by inundating surrounding coastal communities with huge waves up to 30 meters (100 feet) high. A structure might have all the appearances of stability, yet offer nothing but danger when an earthquake occurs. 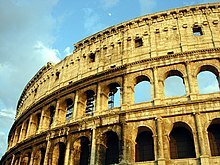 The crucial fact is that, for safety, earthquake-resistant construction techniques are as important as quality control and using correct materials. Earthquake contractor should be registered in the state/province/country of the project location (depending on local regulations), bonded and insured. 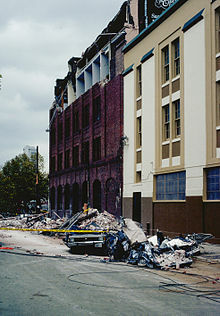 Adobe buildings are considered very vulnerable at strong quakes. However, multiple ways of seismic strengthening of new and existing adobe buildings are available. Steel structures are considered mostly earthquake resistant but some failures have occurred. A great number of welded steel moment-resisting frame buildings, which looked earthquake-proof, surprisingly experienced brittle behavior and were hazardously damaged in the 1994 Northridge earthquake. 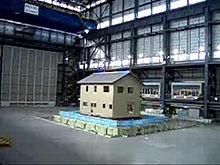 After that, the Federal Emergency Management Agency (FEMA) initiated development of repair techniques and new design approaches to minimize damage to steel moment frame buildings in future earthquakes. ^ "Geotechnical Earthquake Engineering". earthquake.geoengineer.org. ^ "The NIED 'E-Defence' Laboratory in Miki City]". Retrieved 3 March 2008. ^ "CMMI – Funding – Hazard Mitigation and Structural Engineering – US National Science Foundation (NSF)". nsf.gov. Retrieved 2012-07-31. ^ "Passive and active vibration isolation systems – Theory". Physics-animations.com. Retrieved 2012-07-31. ^ "Clark, Liesl; "First Inhabitants"; PBS online, Nova; updated Nov. 2000". Pbs.org. Retrieved 2013-07-28. ^ a b "4. 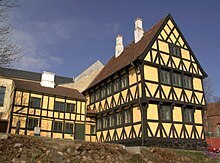 Building for earthquake resistance – Earthquakes – Te Ara Encyclopedia of New Zealand". Teara.govt.nz. 2009-03-02. Retrieved 2012-07-31. 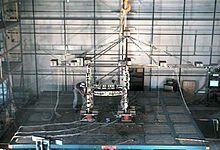 ^ "Building Technology + Seismic Isolation System – Okumura Corporation" (in Japanese). Okumuragumi.co.jp. Retrieved 2012-07-31. 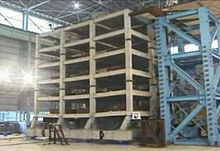 ^ "Earthquake-Resistant Construction". Nisee.berkeley.edu. Archived from the original on 2012-09-15. Retrieved 2012-07-31. ^ neesit. "Niigita Earthquake 1964 – YouTube". www.youtube.com. Retrieved 2012-07-31. ^ "Bad construction cited in quake zone – World news – Asia-Pacific – China earthquake | NBC News". MSNBC. Retrieved 2013-07-28. ^ "Earth Architecture – the Book, Synopsis". Retrieved 21 January 2010. ^ "simulacion terremoto peru-huaraz – casas de adobe – YouTube". Nz.youtube.com. 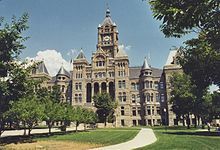 2006-06-24. Retrieved 2013-07-28. ^ "Shake table testing of adobe house (4A-S7 East) – YouTube". Nz.youtube.com. 2007-01-12. Retrieved 2013-07-28. ^ Rossen Rashkoff. "Reinforced Brick Masonry". Staff.city.ac.uk. Archived from the original on 2013-08-19. Retrieved 2013-07-28. ^ Reitherman, Robert (2012). 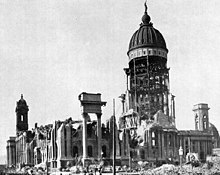 Earthquakes and Engineers: An International History. Reston, VA: ASCE Press. pp. 394–395. ISBN 9780784410714. Archived from the original on 2012-07-26. ^ Eugene Trahern (1999). "Loss Estimation". Archived from the original on 2009-04-10. ^ Craig Taylor; Erik VanMarcke, eds. (2002). Acceptable Risk Processes: Lifeline and Natural Hazards. Reston, VA: ASCE, TCLEE. ISBN 9780784406236. Archived from the original on 2013-01-13.